Advantage Multi is a once a month topical application that contains a combination of the insecticide (imidacloprid) and the parasiticide (moxidectin). Advantage Multi for Dogs is used for the prevention of heartworm and the treatment and control of flea infestations, hookworms, roundworms and whipworms. Advantage Multi for Cats is used for the prevention of heartworm and the treatment and control of fleas infestations, roundworms, hookworms and ear mites. Advantage Multi requires a prescription from your veterinarian. The recommended minimum dose is 4.5 mg/lb (10.0 mg/kg) imidacloprid and 0.45 mg/lb (1.0 mg/kg) moxidectin, once a month, by topical administration. Do not apply to irritated skin. View Advantage Multi Drug Facts Sheet. 1.) Remove one dose applicator tube from the package. As specified in the following table, administer the entire contents of the Advantage Multi® for Cats tube that correctly corresponds with the body weight of the cat. *Cats over 18 lbs. should be treated with the appropriate combination of Advantage Multi for Cats tubes. 2.) While holding the tube in an upright position, remove the cap from the tube. 3.) Turn the cap over and push the other end of cap onto the tip of the tube. 4.) Twist the cap to break the seal and then remove the cap from the tube. 5.) Part the hair on the back of the cat's neck at the base of the head. until the skin is visible. Place the tip of the tube on the skin and apply the entire contents directly on the exposed skin. Lift tube away from the skin before releasing pressure on tube. Do not get this product in the cat's mouth or eyes or allow the cat to lick the application site for 30 minutes. Treatment at the base of the head will minimize the opportunity for ingestion by grooming. In households with multiple pets, keep animals separated to prevent licking of the application site. Stiff, matted hair or a wet, oily appearance of the hair may be observed at the application site on some cats. This is temporary and does not affect the safety and effectiveness of the product. Heartworm Prevention: For prevention of heartworm disease, Advantage Multi for Cats should be administered at one-month intervals. Advantage Multi for Cats may be administered year-round or at a minimum should start one month before the first expected exposure to mosquitoes and should continue at monthly intervals until one month after the last exposure to mosquitoes. If a dose is missed and a 10-day interval between doses is exceeded, administer Advantage Multi for Cats immediately and resume the monthly dosing schedule. When replacing another heartworm preventative product in a heartworm prevention program, the first treatment with Advantage Multi for Cats should be given within one month of the last dose of the former medication. At the discretion of the veterinarian, cats older than 6 months of age may be tested to determine the presence of existing heartworm infection before treatment with Advantage Multi for Cats (See Adverse Reactions - Post-Approval Experience). Flea Treatment: For the treatment of flea infestations, Advantage Multi for Cats should be administered at one-month intervals. If the cat is already infested with fleas when the first dose of Advantage Multi for Cats administered, adult fleas on the cat will be killed. However, re-infestation from the emergence of pre-existing pupae in the environment may continue to occur for six weeks or longer after treatment is initiated. Cats treated with imidacloprid, including those with pre-existing flea allergy dermatitis have shown clinical improvement as a direct result of the elimination of fleas from the cat. Ear Mite Treatment: For the treatment of ear mites (Otodectes cynotis), Advantage Multi for Cats should be administered once as a single topical dose. Monthly use of Advantage Multi for Cats will control any subsequent ear mite infestations. Intestinal Nematode Treatment: For the treatment and control of intestinal hookworm infections caused by Ancylostoma tubaeforme (adults, immature adults and fourth stage larvae) and roundworm infections caused by Toxocara cati (adults and fourth stage larvae), Advantage Multi for Cats should be administered once as a single topical dose. The recommended minimum dose for a ferret is 9 mg/lb (20.0 mg/kg) imidacloprid and 0.9 mg/lb moxidectin, once a month, by topical administration. Only the 0.4 ml applicator tube volume (Advantage Multi 9) should be used on ferrets. 1.) Remove one dose applicator tube from the package. 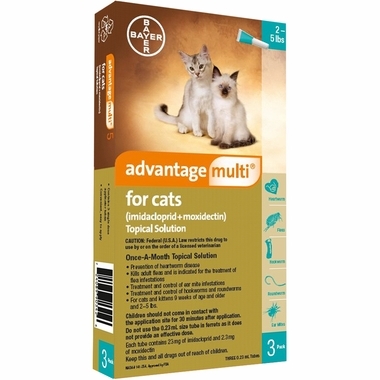 Administer the entire contents of the Advantage Multi for Cats tube (0.4 mL). 5.) Part the hair on the back of the ferret's neck at the base of the head, until the skin is visible. Place the tip of the tube on the skin and apply the entire contents directly on the exposed skin. Lift tube away from the skin before releasing pressure on tube. Do not get this product in the ferret's mouth or eyes or allow the ferret to lick the application site for 30 minutes. Treatment at the base of the head will minimize the opportunity for ingestion by grooming. In households with the multiple pets, keep animals separated to prevent licking of the application site. Stigg, matted hair or a wet, oily appearance of the hair may be observed at the application site on some ferrets. This is temporary and does not affect the safety and effectiveness of the product. Heartworm Prevention: For prevention of heartworm disease, Advantage Multi for Cats should be administered at one-month intervals. Advantage Multi for Cats may be administered year-round or at a minimum should start one month before the first expected exposure to mosquitoes and should continue at monthly intervals until one month after the last exposure to mosquitoes. If a dose is missed and a 30-day interval between doses is exceeded, administer Advantage Multi for Cats immediately and resume the monthly dosing schedule. Flea Treatment: For the treatment of flea infestations on ferrets, Advantage Multi for cats should be administered at one-month intervals. If the ferret is already infested with fleas when the first dose of Advantage Multi for Cats is administered, adult fleas on the ferret will be killed. However, re-infestation from the emergence of pre-existing pupae in the environment may continue to occur for six weeks, or longer after treatment is initiated. I have raised 4 mature cats using this product and my cats never fuss when I put this on their head. Both the cats and I are happy knowing they won't be bothered with fleas and are protected from other parasites who would like to make their home in them. I never see fleas or flea dirt in my home. This is a wonderful product. Merchant Response:Advantage Multi is just about as strong of protection can get. Carol, and your for cats take care in beautiful Roseville.